IC 1848, commonly called the Soul Nebula, is a star cluster surrounded by emission nebula SH2-199. It is located in the Perseus arm of our galaxy in the constellation of Cassiopeia. The ultraviolet radiation and wind from the young hot stars in the cluster are blasting away the nebula dust cloud giving the nebula its shape. 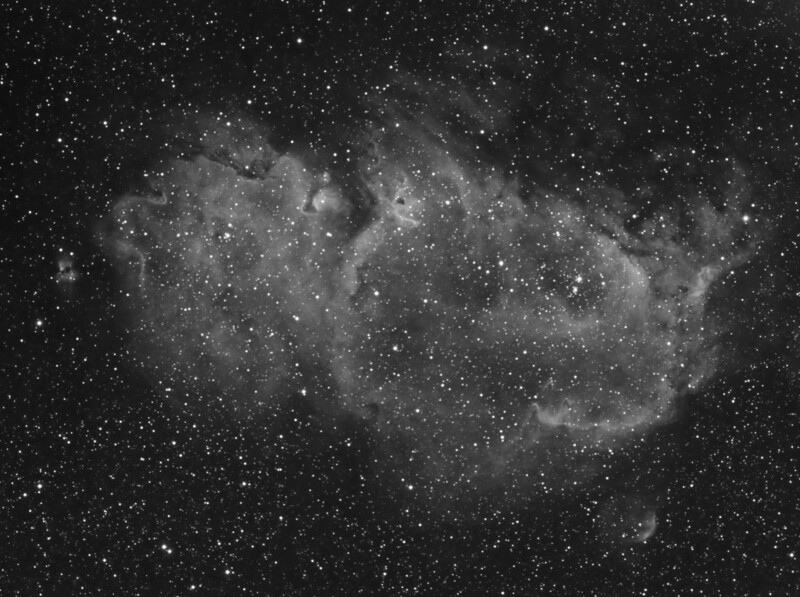 The parts of the dust cloud that are denser form the perimeter structure of the Soul nebula and the less dense areas form the inner structure. In the denser parts of the nebula there are several pillars of compressed gas and dust where star formation is occurring. There are also several other smaller open clusters that have formed in the outer perimeter. IC1848 and the other smaller clusters in this area are all part of the CAS OB6 association. IC 1871 is the small fan shaped emission nebula to the left of the Soul nebula. It appears that there is a dust cloud nearly splitting the nebula in two.